I had no idea what fracking was before moving to South Dakota. It turns out North Dakota is a fracking state and once I learned what fracking was I was understandably concerned. Here is the quick overview from my understanding. Fracking is removing natural gas from the earth. Frackers dig a really deep hole, pump water and other fracking fluids in to said hole and miraculously natural gas comes out. The problem is this contaminated water can leach in to underground waterways and then make the water in your house flammable. Then fracking companies have the audacity to tell you it isn’t dangerous. Well, now that that lecture is over, The Fracking King is set at the intersection of fracking, Scrabble and a boys boarding school. Winston Crwth (it rhymes with truth) is a competitive scrabble player who just got a prestigious Dark Oil & Gas Scholarship to attend Hale boarding school in rural Pennsylvania. At the boarding school Winston makes friends, plays scrabble, chats with the states poet laureate, and plots to get a meeting with Pennsylvania governor Linda King LaRue to talk about the fact that Hale kids are getting sick and the water in his room caught on fire. I liked this novel. But I have a soft spot for novels that make little sense and then wrap up in impressive ways. 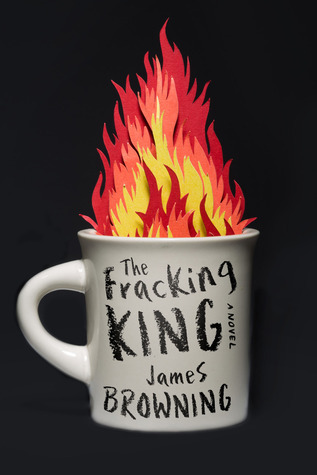 The problem with The Fracking King was that things never really made a lot of sense and then the book ended without the satisfying wrapped up feeling. With the short length of this book there was plenty of space for the author to expand on ideas and wrap things up more thoroughly. So, while I liked it, mostly because I was interested in the subject matter, I didn’t love it. Overall, The Fracking King was about two things I’m really interested in, Scrabble and fracking but the disjointed storyline and the lackluster ending made this only an okay read for me rather then something I could thoroughly enjoy.